Stansted Airport is one of the most important airports in the United Kingdom, occupying a well-deserved four spot in the busiest rank, after Heathrow, Gatwick and Manchester. In 2012, more than 17 million passengers used its services. The main benefit that it offers to its customers is the accessible prices, being known as a base for low-cost airline companies. These are often offered by Ryanair, which gives the passengers the possibility to choose between more than 100 destinations worldwide. 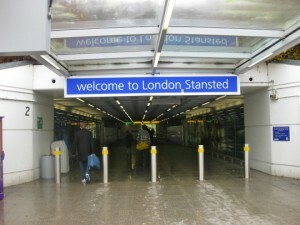 Stansted Airport also has partnerships with private jets companies, such as Harrods Aviation. The busiest international routes so far have been Dublin (Ireland), Rome and Bergamo (Italy) Malaga and Barcelona (Spain). Another symbol and adorned location in the United Kingdom is the Port of Tilbury, situated on the River Thames. This is London’s main port and it usually provides services for importing paper and cars. The Port of Tilbury also offers facilities for cargoes. The other two major container ports are Southampton and Felixstowe. An interesting fact is that Tilbury Port has been used quite a lot as a location in several cinematographic productions. The most famous movies are: Indiana Jones and the Last Crusade, Batman Begins and Alfie. The port is guarded by another British symbol: The Port of Tilbury Police. A passenger liner was opened in the ‘60s, known as an entry for a great deal of immigrants. Nowadays, the so-called London Cruise Terminal is mainly used by small cruise ships. For a Stansted to Tilbury Port Transfer by rail, you have two options. The first would be to take the train from Stansted Airport (that arrives every 15 minutes) via London Fenchurch Str (that comes every 20 minutes). The total duration of the journey would take about 1 hour and 32 minutes. The second option is to take the bus from Stansted Airport (every 20 minutes) via Basildon Town Centre and Grays Bus Station (that arrives every 60 minutes). The journey would take about 2 hours and 8 minutes. A Stansted to Tilbury Port Transfer by car can be done by choosing the M11 highway and then the M25. London Stansted Airport is at a 41.6 miles distance from the Tilbury Port. A Taxi Transfer from Stansted to Tilbury Port with 247 Stansted Airport Transfer is going to take about 1 hour and 8 minutes, including traffic. The price for a Stansted Airport to Tilbury Port Taxi Transfer starts from 68 GBP. – Best value for money Stansted to Tilbury Port Shuttle.